Fans will have a chance to rekindle old memories, most of them quite pleasant, during the San Diego Sockers’ annual alumni game that will take place during halftime of Sunday’s (April 7) regular season Major Arena Soccer League match against the Rio Valley Grande Barracudas at Pechanga Arena San Diego. This year’s alumni game edition will pit the Team 1980s/1990s against Team 2000s. This is the first time the game has featured this format. Besides the alumni game, former Socker standout (and Grossmont High School alumnus) Paul Wright will have his jersey number retired and a banner raised in a pregame ceremony. The alumni game will feature a treasure trove of Sockers legendary players from across the spectrum of the franchise’s existence, many of whom have contributed to the Sockers’ 14 indoor soccer league championships spanning 1982 to 2013 in the North American Soccer League (1982, 1984), Major Indoor Soccer League (1983, 1985-86, 1988-1992), PASL-Pro (2009-11) and PASL (2012-13). Vidal Fernandez and Juli Veee will coach Team 80s/90s. The roster will include Tommy Reasoner, David Banks, Carlos Basso, Ben Collins, Ray Taila, Brian Quinn, Jacques Ladouceur, Paul Dougherty, Toby Taitano, Diego Terry, George Katakalidis, Cha Cha Namdar, Nick Owarchuk, Rene Ortiz, Frank Vizcarra, Shahin Safarian, Mike Demko, Tom Crane, Jason Heth and Felipe Hernandez. Fernandez, a product of Chula Vista High School, donned a Sockers jersey from 1981-87 during the team’s original run in the NASL and MISL, winning three league championships. 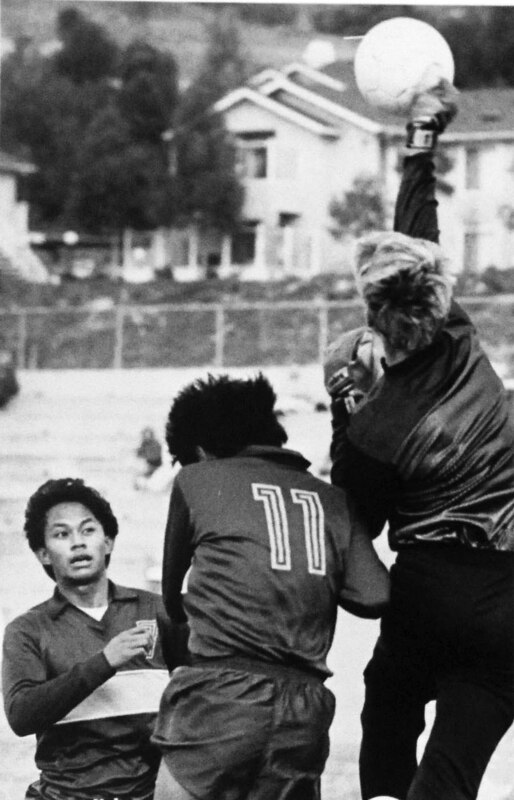 Fernandez earned honors as the 1977 San Diego Section Player of the Year after the Spartans won back-to-back CIF championships. He is a member of the Sweetwater Union High School District Hall of Fame and the San Diego State University Aztecs Hall of Fame. He later coached soccer at his alma mater. Injuries hobbled Fernandez during his pro career, though he scored 34 goals in 47 games during the 1982-83 indoor season. He appeared in 51 games for the Sockers outdoor team from 1982-84, scoring 12 goals. Ladouceur lived in Chula Vista during his stint with the Sockers from 1985-1992, appearing in 279 games with 51 goals. He is now the women’s soccer coach at Palomar College. Ortiz, who played one year of high school soccer at Southwest High School in 1987, attracted the notice of the Sockers with his high scoring rate and the MISL team selected him in the 1987 MISL draft. He played three indoor winter seasons with the Sockers, winning three consecutive championships. In the summer of 1988 and 1989, he played for the San Diego Nomads of the outdoor Western Soccer Alliance, winning the 1989 WSA championship. In 1990, he moved to the Milwaukee Wave in the National Professional Soccer League. In 1993, the Sockers moved to the new Continental Indoor Soccer League, which played a summer indoor schedule. 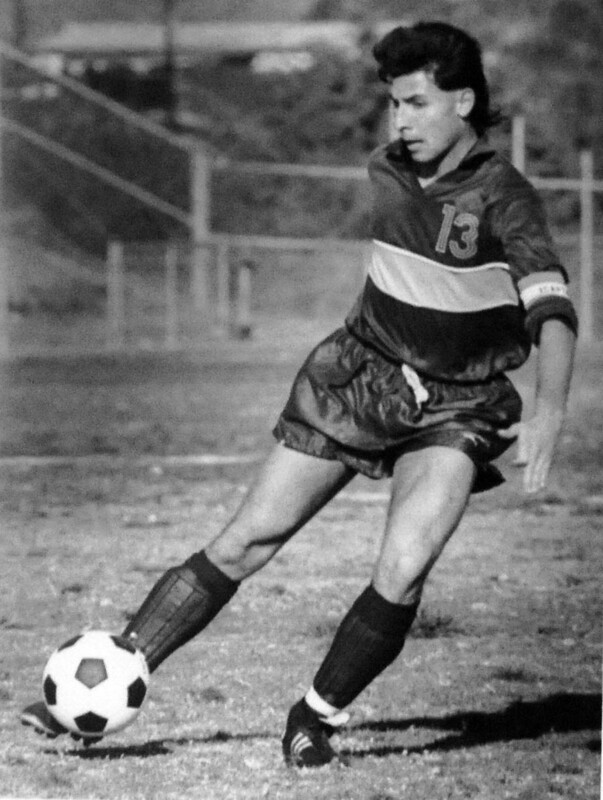 At the end of the 1992–1993 NPSL season, Ortiz signed with the Sockers for the 1993 CISL season, returning to the Wave for the 1993–1994 NPSL season. Ortiz returned to the Sockers for the 1994 and 1995 seasons. He scored six goals in 49 games with the Sockers from 1987-1990 and showed his maturity as a player with 60 goals in 71 games for the Sockers from 1993-95. He scored 92 goals in 133 games with the Wave from 1990-94. He played two games with the Dallas Burn of Major League Soccer in 1996 and suited up for three different indoor teams before retiring in 2000. Ortiz currently serves as an assistant coach with the Sockers’ MASL team and also is the head coach of the Sockers’ development team in the MASL2. The Sockers2 completed an undefeated season (14-0) after winning all 12 regular season and two playoff games, defeating Cuervos Juarez, 7-5, at last weekend’s MASL2 championship tournament in Ontario. 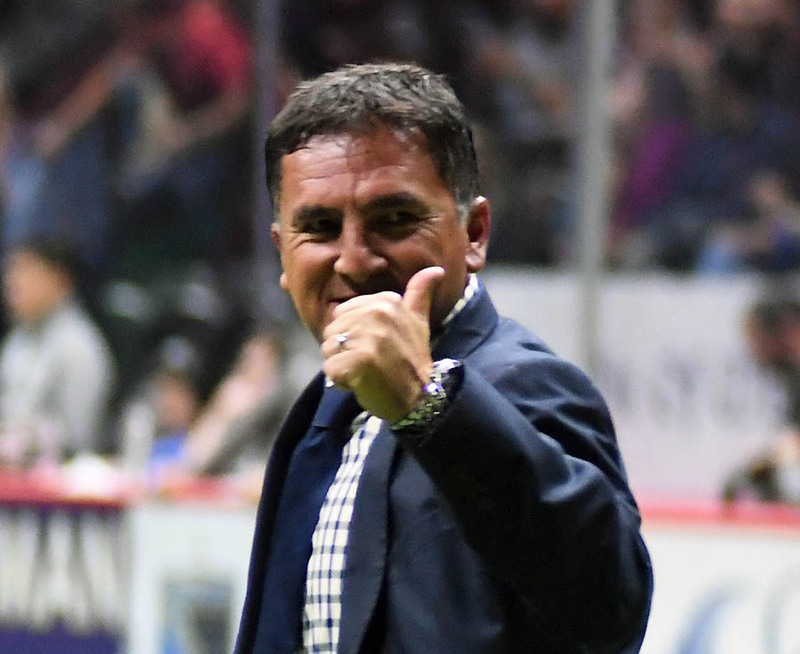 Ortiz earned honors as the 2018-19 MASL2 Coach of the Year. Ortiz also serves as the girls soccer coach at Hilltop High School and continues to hold the position as the head coach of the Mexican national futsal team. Quinn is another former Sockers coach to don a jersey for this year’s alumni game. He appeared in 307 games for the MISL Sockers from 1983-1991 before returning to coach the team for the 1995-96 season in the CISL and 2001-04 seasons in the MISL II. Quinn, a native of Belfast, Northern Ireland, became an instant fan favorite for his blue-collar playing style. He scored 25 goals in 32 games during his first indoor stint with the Sockers and 155 goals in 255 games during his second stint with the team. He received induction in 2013 to the Indoor Soccer Hall of Fame along with former Sockers teammate Toth. After earning U.S. citizenship, Quinn earned 48 caps for the U.S. men’s national outdoor team from 1991-94. Quinn, 58 is the current men’s soccer coach at the University of San Diego after serving as an assistant coach with the Dons since 2008. He served as the coach of the San Jose Clash in MLS from 1997-99. Guy Newman and Toth will coach Team 2000s. The roster includes Chiky Luna, Shandley Phillips, Robert Romero, Scott Martin, David Beltran, Mike Mercuriali, Shawn Beyer, Todd Bernard, Sean Bowers, Gus Castaneda, Anthony Meza, Maurico Alegre, Timothy Edwards, Aaron Susi, Wright, Nate Hetherington, Anthony Medina and current Sockers head coach Phil Salvagio. Medina, a Valhalla High School alumnus, won four PASL championships with the Sockers from 2009-13 during his nine-year career with the club. He finished his Sockers career by scoring a hat trick in a 10-3 win over El Paso to cap the 2017-18 season. He finished his Sockers career with 99 goals and 56 assists in 145 games. None the least of his accomplishments, he was a part of the Sockers’ U.S. pro sports franchise 48-game winning streak (2010-13) that is proudly commemorated by a banner hanging in the rafters of the team’s home arena. Castaneda, Meza, Ortiz and Taitano, another Valhalla High School alumnus, all participated in last year’s alumni game. 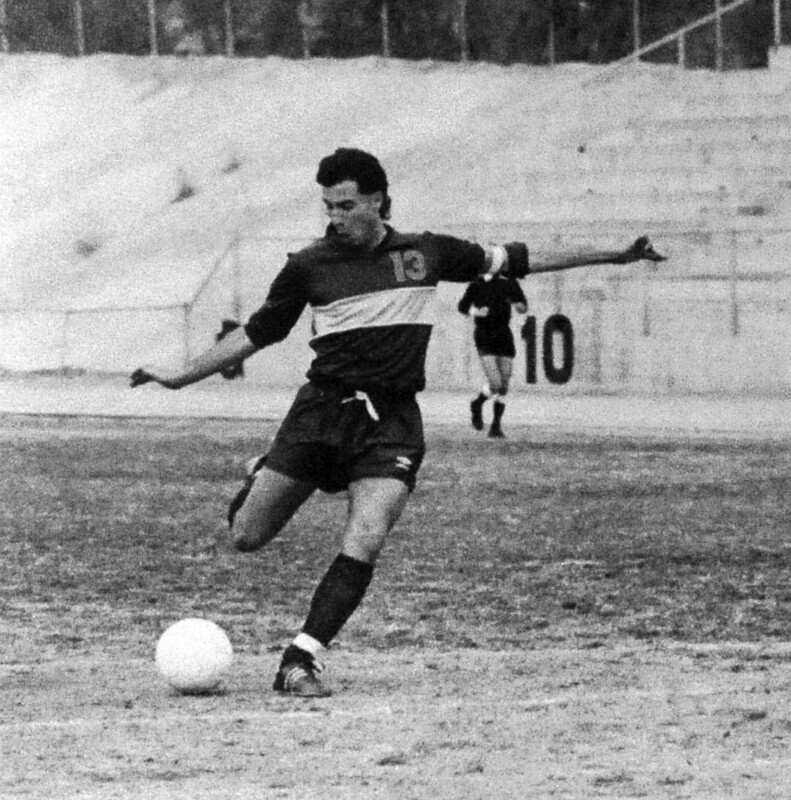 Castaneda, a Bonita Vista High School alumnus and the CIF Class 3A Player of the Year in 1990, scored a goal. Castaneda, who helped the Barons win the 1989 3A championship via a 2-1 double overtime victory against Monte Vista, appeared in one game with the MISL Sockers in 1991-92 and appeared in four games with the team during its inaugural 1993 season in the CISL. He played two seasons with the Las Vegas Dustdevils from 1994-95, winning the 1994 CISL championship. He returned to the Sockers for the 1996 season, appearing in two games. He scored 18 goals and recorded13 assists during his 58-game career with the Sockers and Dustdevils. Castaneda started training with the Sockers in 1990 but was playing with the reserve team when he was 16. “My memories are going from being a young bright-eyed fan of the Sockers to actually being a signed player to the first team at 19 years of age,” the former BVHS standout said. “I was very fortunate to train day-in and day-out with legends like Brian Quinn, Kevin Crow, Victor Noguiera, Thompson Usiyan, Cha Cha Namdar and, of course, having the legend in Ron Newman as a coach who believed in me. The team won the 1992 MSL championship, though Castaneda appeared in only two games. “The experience and life lessons that I absorbed through eight months of training and having to prepare as though I might play while being around these guys have made a lasting impression that has helped me to this day running a high level soccer club in Orange County,” he said. Castaneda said being traded to Dustdevils days prior to the 1994 season turned out to be a blessing. “Guy Newman, Ron Newman’s son, was the expansion team’s head coach who I had had as a coach when I was 17 with a youth team,” Castaneda elaborated. “They traded for me when I was not able to come to terms with the Sockers. “I was very blessed to have been put in that situation. I learned a lot about myself as a player and person; I was a little disappointed that I wasn’t going to be playing for my hometown team but as luck would have it, we drew the Sockers in the first round of the playoffs and we beat them two of three games to move on to the next round. “Once we knocked out Anaheim Splash, we faced Tatu and the Dallas Sidekicks. We lost Game 1 (by a score of) 10-4 in Dallas. At this point I didn’t feel very confident about our chances but we rallied in our home game to 10-9 win overtime which set the stage for a winner-take-all game in Dallas. “Dallas filled up their arena (18,000) with fans (16,652 were in attendance), you couldn’t hear anything when on the field. We ended up winning the game 9-8. It was without question the highlight of my professional indoor soccer career. The 1996 CISL campaign proved to be Castandeda’s last official season. 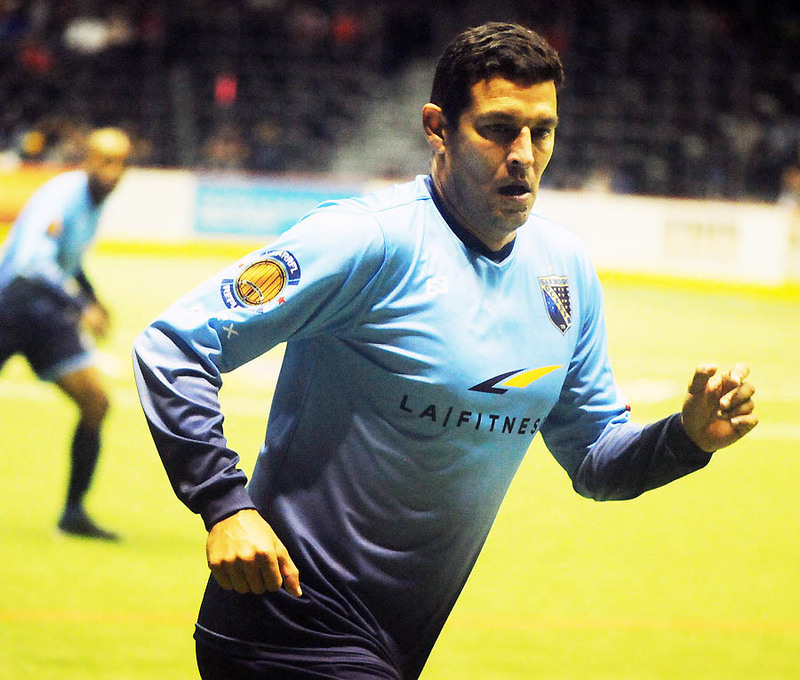 “I helped out in the resurgence of the Sockers in 2001-03 but never appeared in any games,” Castaneda said. “I also trained regularly with the Sockers from 2012-16; it was a great way to stay in shape and, most importantly, the camaraderie … being around the team is priceless. The Sockers – old and new – continue to be one big family. Meza, another BVHS alumnus, was a member of the Barons’ 1989 CIF championship team and 1990 CIF runner-up team. After graduating from high school in 1990, Meza played a short time with the San Diego Gauchos semi-pro team in 1991 while going out for SDSU’s men’s team coached by Chuck Clegg. “I was training with the Sockers during that time with Gus,” Meza recalled. “I ended up joining the reserve team during the offseason (1992) instead of college and was a backup goalkeeper (in the CISL in 1993 with the Sockers). “I ended up going to Portland the following year and joining the Portland Pride team (1994). I was a backup to Jim Gorsek – yes, the same Jim Gorsek from the Sockers. “After that and, with an injury, I went back to SDSU and ended up getting my degree in electrical engineering, had two kids and then didn’t get back into the game until I was asked to coach. “It’s been about 20 years now. I have received my USSF B license and I currently coach club at San Diego Soccer Club, which is a merge of FC San Diego and PQ Premier. I came from the PQ Premier side. FC San Diego was Pegasus before that. “I also have been the goalkeeper coach at USD for the past five years with Seamus McFadden, Brian Quinn and Mike Nicholson. “All in all, I’m pretty busy with club soccer, USD, and my goalkeeping business – SOLIDKEEPING — personalized goalkeeping training. I still see Gus and the boys from back then at youth games and on the sidelines. “It’s a real blessing to be involved in the game still after all these years.” Meza said. “I love playing in the Sockers alumni game. It shows the history of our team and the fans really get a kick out of it. Guys from the 1980s, 1990s, 2000s and even 2010s get to all play together. “It’s always a fun time and very humbling for me to join that crew on the field,” Taitano noted of last year’s game. Taitano, who collected 60 assists as a Norseman, scored 44 goals and collected 62 assists during a 76-game pro career that spanned three seasons in the CISL from 1994-96 with the Sockers and Seattle SeaDogs. Taitano ranked fourth in team scoring on the Sockers in 1994 behind John Olu-Molomo, Keder and Rene Ortiz with 24 goals and 23 assists in 28 games. Taitano tallied 40 points (12 goals, 28 assists) during the 1995 season to rank sixth in Sockers scoring. He closed out his CISL career by scoring 19 points (eight goals, 11 assists) in 20 games with Seattle in 1996. Taitano played for the University of San Diego Toreros from 1990-93, finishing as the school’s fifth all-time scorer with 81 points on 17 goals and 47 assists. The 1992 USD squad advanced to the NCAA Division I championship game against Virginia. “I wish I could have been part of the crowd that won a championship (with the Sockers) but it wasn’t meant to be,” Taitano mused. “I still cherish the days of playing for our hometown club and I miss the tomfoolery and needling that took place in the locker room. “The game has given so much to me during my life … national championships with the Nomads as a youth, NCAA runner-up at USD, and then a brief playing career for the Sockers. Not to mention the tremendous education at USD and all of the amazing/lifelong friendships. The 2018-19 Sockers are currently riding a 19-game winning streak and own the best record in the MASL at 21-1. For more information, visit the website at www.sdsockers.com. A 1986 graduate of Grossmont High School, Wright will join a number of Sockers legends to have had their numbers retired and a banner raised in the arena. The popular forward, who played both indoor and outdoor soccer from 1987 through the 2012-13 season, will have his No. 3 jersey hoisted to the rafters during Sunday’s pregame ceremony. Retired numbers by the Sockers include those worn by Juli Veee (22), Kaz Deyna (10), Jean Willrich (15), Kevin Crow (12), Brian Quinn (14), Zoltan Toth (1) and head coach Ron Newman. Wright set quite a standard himself. He scored 435 goals and recorded 421 assists in his 603-game career with the Sockers, Cleveland Crunch, Milwaukee Wave, Baltimore Spirit, Wichita Wings, Sacramento Knights, Baltimore Blast, Anaheim Bolts, and outdoors in the Major League Soccer with Kansas City. Wright, known at every level for his speed, set the Grossmont High School single-season record for scoring with 39 goals his senior year. Wright first made a splash on the soccer pitch with the San Diego Nomads in the Western Soccer Alliance (later Western Soccer League), from 1987-1990. During that time, he scored 15 goals in 37 games for the Crunch in the original Major Indoor Soccer League from 1989-1990. The Crunch traded Wright to the Sockers in March 1990 and the speedy Wright left his mark in his first stint with the team by scoring 101 goals in 100 games from 1990-92. Wright led the Sockers in scoring during the 1991-92 season with 50 goals and 27 assists in just 39 games after finishing third in team scoring the previous season with 38 goals and 23 assists in 51 games. 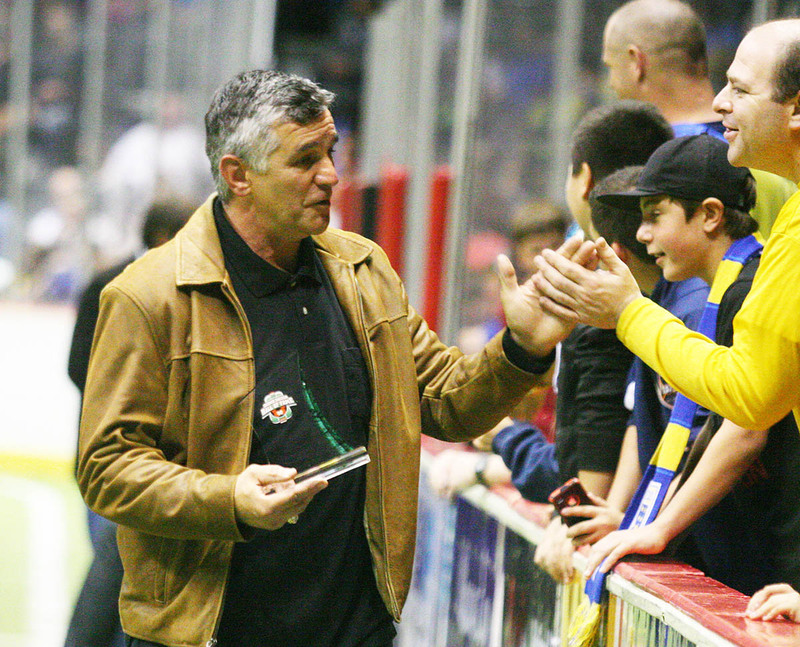 The Sockers won MISL championships both seasons; Wright was named the Unsung Hero Award winner in the 1991 championship series. The MISL folded following the 1991-92 season and the Sockers would join the Continental Indoor Soccer League for the 1993 season but without Wright. Wright played the 1993 season for the Milwaukee Wave in the National Professional Soccer League, scoring 45 goals in 25 games. The Wave owns distinction as the longest continuously operating professional soccer team in the United States, being active since 1984. Wright returned to outdoor soccer with the Los Angeles Salsa in the American Professional Soccer League, notching 25 goals in 42 games from 1993-94. Wright returned to play indoor soccer from 1993-95 for the Baltimore Spirit and Wichita Wings in the NPSL and the Sacramento Knights in the CISL. He tallied 62 goals in 35 games for the Blast in 1993-94; the Knights lost to Monterrey La Raza in the 1995 CISL final. Wright joined the Kansas City Wiz as a charter member of MLS in 1996 and scored 11 goals in 88 matches with the team through 1998 as he was reunited with Newman as the Kansas City coach. The Wiz advanced to the conference final its first season, losing to the L.A. Galaxy. The renamed Wizards finished as the regular season conference champions in 1997 but lost in the opening round of the playoffs to the Colorado Rapids. The MLS team is now known as Sporting Kansas City following a rebrand in 2011. Wright remained on the outdoor pitch from 1999-2002 as a member of the Western Mass Pioneers for which he scored 22 goals in 55 matches. The Pioneers won the 1999 USL D-3 Pro League championship and advanced to the conference finals in 2000. Wright remained on the East Coast to play indoor soccer for the Blast, appearing in 124 matches from 1999-2002 while scoring 86 goals, as the team made the transition from the NPSL to the rebranded MISL II. The Blast made appearances in the conference final in both 1999-2000 and 2000-01. Wright appeared in seven games on loan to the Philadelphia Kixx in 2001. Wright has played four separate times for the Sockers during his career. He rejoined the team in the second version of the MISL from 2002-05 during which he scored 33 goals in 59 games. Wright played for the Southern California/San Diego Fusion during the 2006 outdoor season in the National Premier Soccer League. When the third incarnation of the Sockers debuted in the Professional Arena Soccer League, Wright signed with the fledgling club and appeared in 28 games while tallying 24 goals from 2009-11. 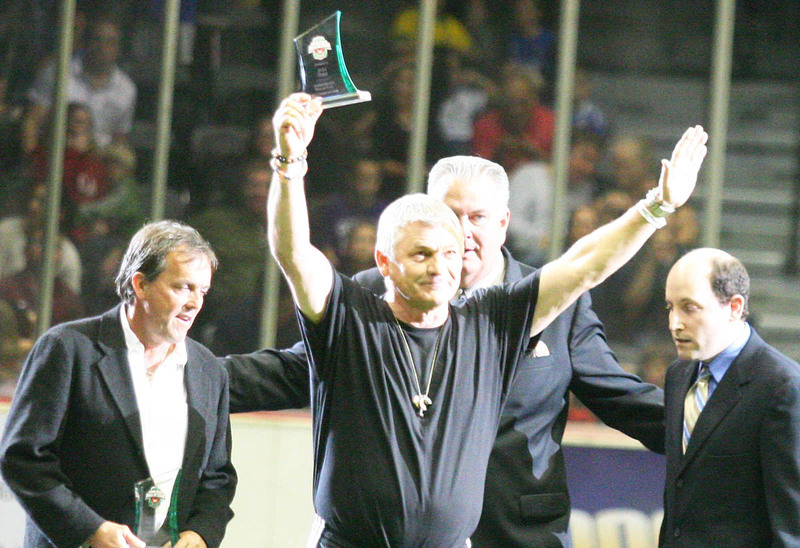 The Sockers won three PASL and three U.S. Open Cup for Arena Soccer championships during Wright’s tenure with the reborn franchise. Wright saw limited duty in his final years of playing indoor soccer, appearing in eight games (scoring four goals) for the PASL Anaheim Bolts in 2011. He scored six goals in nine games after rejoining the Sockers for the 2012-13 season. He retired as an active player at age 43 following the Sockers’ 8-6 triumph over the Detroit Waza in the 2013 PASL championship game in which he scored a goal. At the time, he called his retirement from the game he loved “bittersweet” but admitted it was the right time to stop the punishment to his aging body. 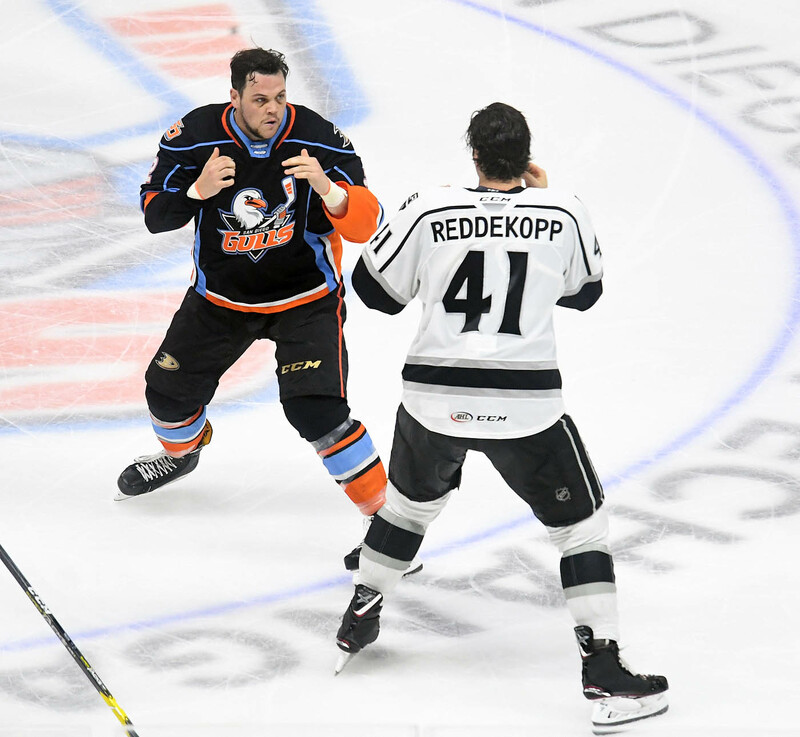 The San Diego Gulls dispatched the visiting Ontario Reign by a score of 6-1 Friday night (April 5) on Fan Appreciation Night at Pechanga Arena San Diego. Sam Carrick, the Gulls’ leading scorer, dispatched the club’s single-season scoring record in the process. Carrick scored two goals and one assist to extend his season totals to 30 goals and 29 assists for 59 points to eclipse the team’s previous single-season scoring high of 57 points turned in by Chris Mueller and Brandon Montour during the 2015-16 season, the team’s first in San Diego. Carrick also became the first Gull to score 30 goals in a season. 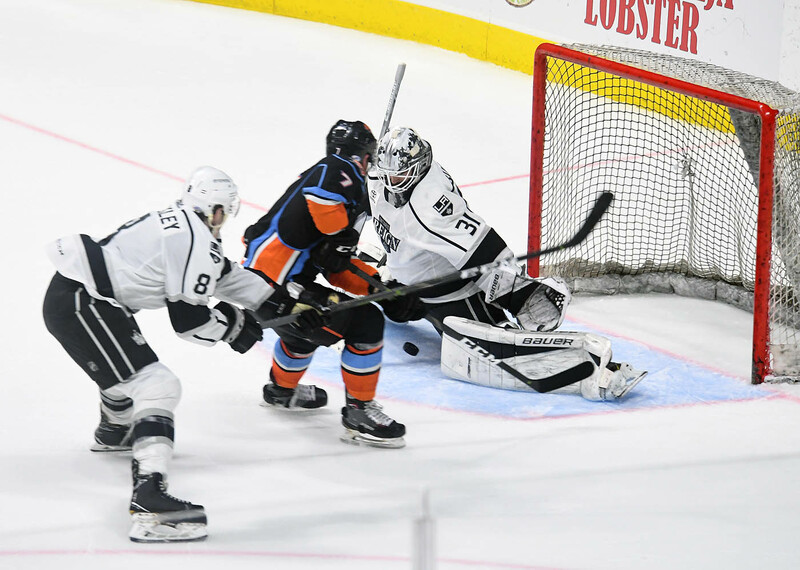 The two points the Gulls earned in the standings were deserving of equal billing as the team greatly enhance its chances of qualifying for this year’s American Hockey League Calder Cup playoffs. 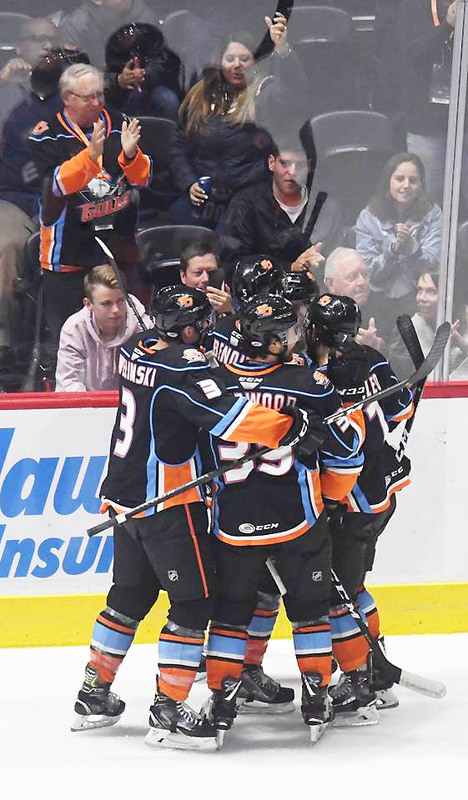 With the win, witnessed by a gathering of 10,708 fans, the third place Gulls (35-23-4-3, 77 points) moved to within two standings points of the second place San Jose Barracuda (36-21-3-4, 83 points) in the Pacific Division standings and three points ahead of the fourth place Tucson Roadrunners (33-23-05-3, 74 points). The top four teams in the division standings qualify for the playoffs. Carrick, who recently received time off to witness the birth of his son, returned to the Gulls lineup with a record-setting touch. Carrick was understandably voted the No. 1 star of the game. San Diego goaltender Kevin Boyle was voted the second star of the game after stopping 34 of 35 shots while the Gulls’ Luc Gazdic earned third star honors with one goal and a five-minute fighting major. The Gulls took a 1-0 lead just 1:33 into the game as veteran Corey Tropp scored on a wraparound shot. Gazdic upped the score to 2-0 just 60 seconds later, assisted by Carrick and Jake Dotchin. 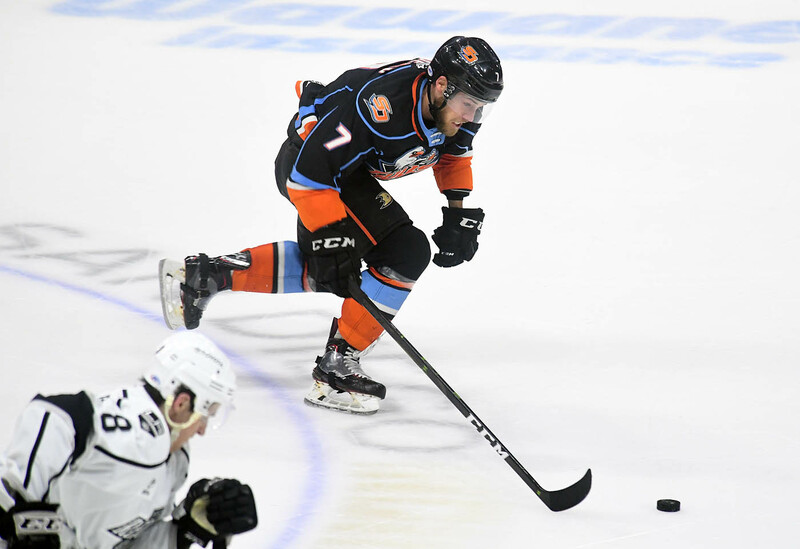 Tropp’s goal, which was unassisted, was his 19th of the season and 35th point.Gazdic picked up his third goal and seventh point while Carrick, the Gulls’ season scoring leader, recorded his 29th assist of the season to tie the club record for 57 points. The Gulls led 3-0 at the end of the first period after Carrick scored his 29th goal of the season with 3:26 left in the period. Carrick set a new single-season scoring record after finding himself alone in front of Ontario goaltender Peter Budaj for a point-blank shot. Andy Welinski and Ben Street assisted on Carrick’s personal record 29thgoal of the season to give Carrick a club record 58 points on the season. Welinski was a late send-down from the NHL parent Anaheim Ducks. The Gulls out-shot Reign 15-14 to end the opening period. The visitors picked up the pace following the initial flurry by the hosts, but Boyle came up big on a pair of good scoring opportunities to keep them off the scoreboard. The Gulls made the score 4-0 at the 3:56 mark of the second period as Justin Kloos scored from the circle to Budaj’s right. Chase De Leo and Kiefer Sherwood drew the assists on the 17th goal of the season for Kloos. The hosts added a fifth unanswered goal at 13:20 on a shorthanded tally by De Leo, who deposited the puck between the legs of Budaj. No assists were awarded on the play. 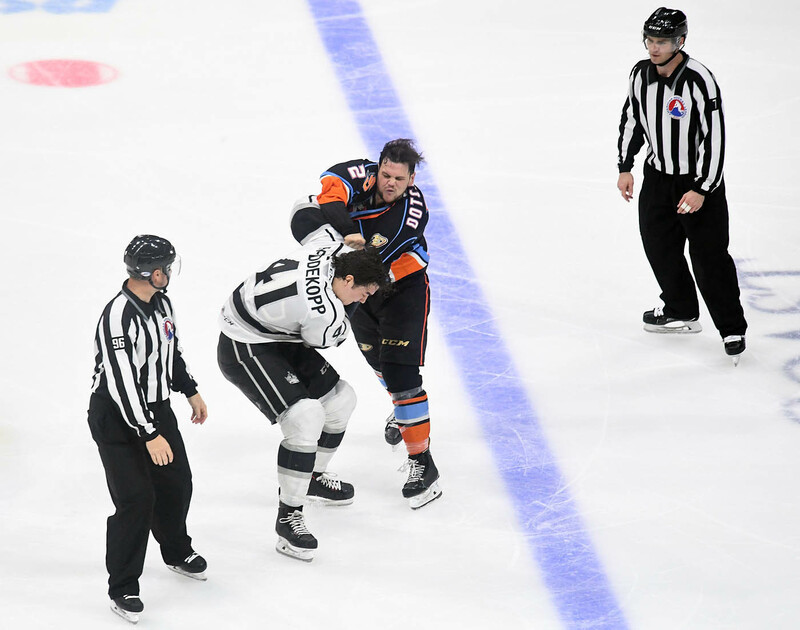 An extended bout of fisticuffs between Gazdic and Ontario’s Jamie Devane injected some additional emotion into the game after the Gulls’ extended bout of scoring. Chaz Reddekoff and Dotchin dropped the gloves at 3:58 much to the delight of fans. The teams combined for 60 minutes in penalties, with three separate fights firing up the crowd. 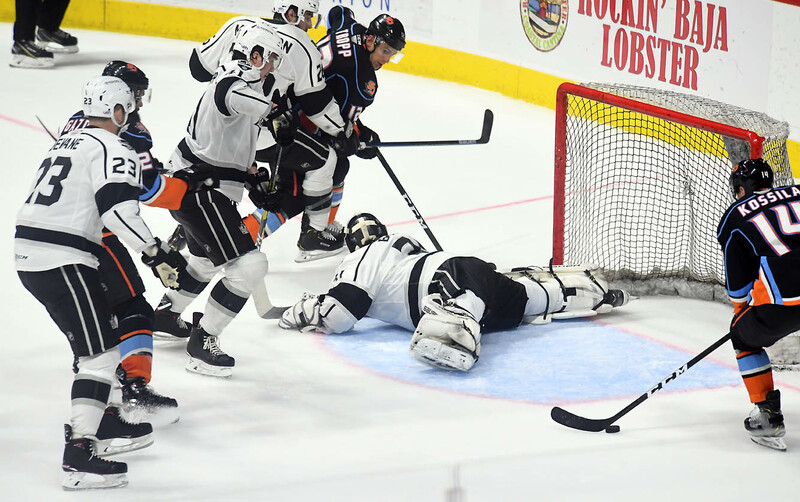 The Reign ruined Boyle’s shutout bid at 4:19 as Austin Strand finally beat the San Diego netminder. Ontario captain Brett Sutter picked up the assist as the visitors made the score 5-1. Carrick kept adding to his club record point total by scoring on a breakaway at 7:35 to increase the Gulls’ lead to 6-1. Street and Trevor Murphy fed the puck to Carrick, whose memorable three-point night upped his season point total to 59. The Gulls were unable to gain any ground on San Jose after the Cuda defeated the visiting Grand Rapids, 3-1, on Friday night but San Jose did gain two valuable points on the the first place Bakersfield Condors (39-20-3-2, 83 points) to reduce Bakersfield’s lead to just four standings points. The Barracuda has four games left on its regular season schedule while the Condors have just three games left. The Gulls cannot catch the Condors for first place in the Pacific Division standings but they remain in contention to slip into second place and grab home ice advantage in the opening round of the divisional playoffs. The Gulls are six points behind Bakersfield with three games left but the Condors would own any tiebreaker should the teams finish with equal standings points. San Diego pulled three points ahead of idle Tucson. The Roadrunners have four regular season games remaining, including two in Tucson against the Gulls. Bakersfield’s magic number to clinch the division title is four points while San Jose needs three points to secure a playoff berth. 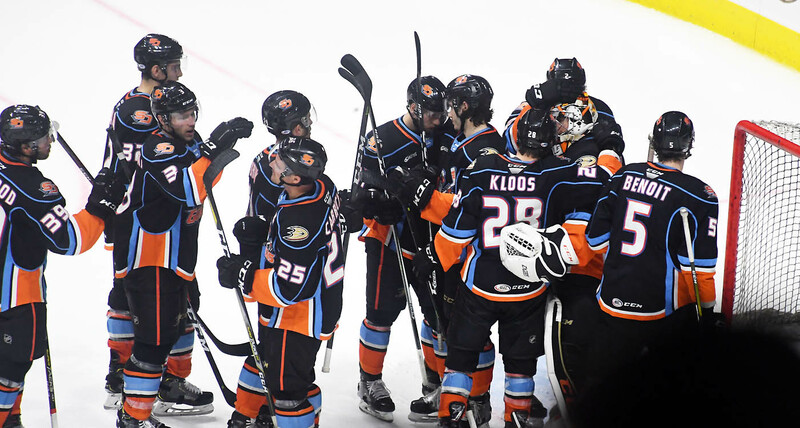 The Gulls’ magic number to secure a playoff berth is down to five while Tucson can clinch a playoff berth by winning its remaining four games. •The Gulls have won back-to-back games and earned points in six of their last nine games (5-3-1-0). •The Gulls posted an 8-3-0-1 record over the Reign to conclude a 12-game season series, with San Diego owning an all-time record of 29-16-1-2. De Leo recorded two points, including his first career shorthanded goal and team-leading 34th assist, to extend his point streak to a career-tying eight straight games (3 goals, 12 points). De Leo collected 11 points in an eight-game stretch from Feb. 1-16. The La Mirada native has recorded 27 points (11 goals, 16 assists) with a +21 rating his last 24 games. The two points also marked his 15th multi-point game. He has 20 goals and 34 assist to rank second in team scoring. Sherwood and Street both have five points (three goals, two assists) in their last five games. Carrick underscored the importance of the team’s last two wins, including Wednesday’s 4-3 come-from-behind victory in San Jose to snap a three-game losing streak. “Two huge wins the last two games from us,” Carrick noted. “One thing we learned from last year is that we can’t really rely on anyone to do the job for us. It’s going to be on us as a team. The funny thing is we have Tucson for the last two games of the year, which will be interesting. We have a big game on Wednesday against San Jose. We know that they’re going to be hungry so we’re looking forward to it. Carrick called Friday’s win a morale booster. San Diego head coach Dallas Eakins said his team “delivered the game plan” in chalking up the resounding win over the last place Reign. Eakins lauded Carrick’s performance and professionalism this season. Boyle captured his his 24th win of the season to improve to 19-7-1 in his last 28 games. Boyle now ranks tied for seventh among AHL goaltenders in wins. Eakins also lauded Boyle’s performance. 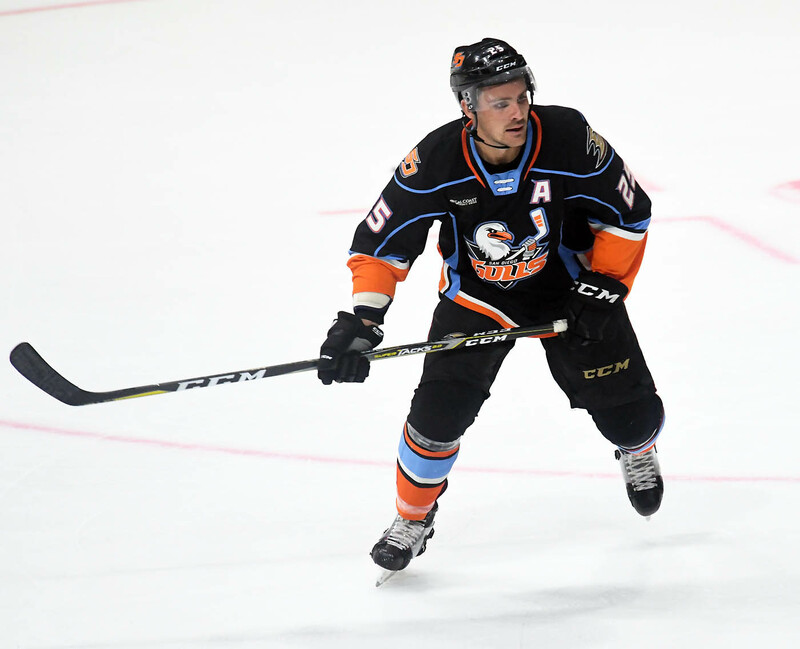 The Gulls will conclude their 2018-19 home schedule on Wednesday, April 10, against San Jose (7 p.m.) before finishing up regular season play with games in Tucson on Friday, April 12 (7:05 p.m. PT), and Saturday, April 13 (7:05 p.m. PT).